An incredible full day tour of all the Pearl Harbor Historic Sites! Its the most popular tour sold at the Pearl Harbor Visitor Center. The Passport to Pearl Harbor is the most popular tour offered by the Pearl Harbor Historic Sites. The Passport to Pearl Harbor allows you to visit all of the Pearl Harbor Historic Sites at a discounted price. • Admission to the USS Bowfin Submarine Museum & Park- Visit one of the most decorated submarine of WWII, sank 44 ships in 9 war patrols. • Admission to the Battleship Missouri-Last of the mighty battleship at the US built and where the surrender of the Japanese took place that ended WWII. • Admission to the Pacific Aviation Museum Pearl Harbor- largest aviation museum in the Pacific, with military aircraft from WWII to the Gulf Wars. • Admission to the National Park Service's new Pearl Harbor Virtual Reality Center- easy to use VR players with staff to assist you. You can do any of the Pearl Harbor destinations in any order, all tours are self-guided. 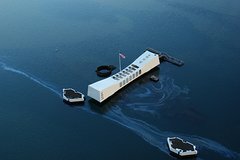 The USS Arizona Memorial Narrated Tour and the USS Bowfin Submarine tours are available in English, German, Spanish, French, Japanese, Mandarin and Korean. The Battleship Missouri and Pacific Aviation Museum Pearl Harbor are available in English, Japanese, Korean and Mandarin. This program includes free parking at the Pearl Harbor Visitor Center and free transportation from the Visitor Center to Ford Island. • Package does not include the movie/boat tickets to the USS Arizona Memorial, for these tickets please visit recreation.gov or call 1-877-444-6777, just $1.50 for each ticket. Or come early, each day there are 1,300 free tickets given out at the Pearl Harbor Visitor Center on a first come, first served basis, gates open at 7am. • The Pearl Harbor Visitor Center is closed on Thanksgiving, Christmas and New Year’s Day. • No reservations are required, tour begins upon check in. • Reminder that the Pearl Harbor Visitor Center has a “no bag policy”; you can bring your wallet, telephone, camera and water.